One of the most critically acclaimed and best-selling independent hip-hop artists of this era, Lyrics Born is not the type to sit still. While recording his fourth solo album, completing new projects, and making decisions at Quannum Projects, he still averaged over 150 sold-out shows a year. He's a whirlwind. His breakthrough solo debut, Later That Day, was a huge indie seller and one of the top 5 most critically acclaimed American hip-hop records of 2003 alongside Jay-Z's The Black Album and Outkast's Love Below/Speakerboxxx. With the release of Everywhere At Once, rapper/producer Lyrics Born finds himself part of a new vanguard of hip-hop artists like Gnarls Barkley, M.I.A., and Kanye West who are pushing the edge with compelling yet instantly accessible sounds. Everywhere At Once reveals the full breadth and depth of his skill and vision: minimalist grooves, reimagined electro, East Bay greasy funk, devoluted punk, futurist dancehall, postmodern blues, tomorrow's slappers. He's an artist who is not interested in the limits set by the market or even his past triumphs. Everywhere At Once leads off with a brace of crowd-pleasers. "Hott 2 Deff", "Differences", and "Cakewalk" feature guest work from Jurassic 5's Chali 2na, Baby James, B'nai, Myron Glasper, Jake One, Amp Live, Trackademicks, and LB's brilliant partner, Joyo Velarde. Kat Ouano from Crown City Rockers, C. Holiday, and The Count are also featured. Although soul-baring songs have marked Lyrics Born's career—think his 1996 indie hit, "Balcony Beach", or 2000's global smash "I Changed My Mind"—Everywhere At Once is also his most personal record to date. Songs like "Whispers" and "Skin I'm In", he admits, are his attempts to come to grips with the passing of his best friend Benjamin Davis and his identity issues growing up Asian American, respectively. "I don't think that people know a whole lot about my personal experience," he says. "And as a people, Asian Americans are kind of like background music in this country. These are parts of my experiences so I just wanted to talk about it." The album reveals much about one of the most beloved artists in the game. His 1997 debut with Lateef the Truth Speaker, Latyrx, sold 100,000 for his influential indie label, SoleSides. When the label was reborn as Quannum Projects, the album he helmed, Quannum Spectrum, yielded him an international hit with "I Changed My Mind". His day-in-the-struggle concept album, Later That Day, featured "Callin' Out", a monster crossover that lodged at 1 at the influential rock station LIVE 105 for 5 weeks. Same ! @$ Different Day collected new tracks and alternate versions of tracks and became Quannum Projects' fastest seller. Overnite Encore captured the excitement and intensity of LB's live show, and produced another chart-topper, "I'm Just Raw". 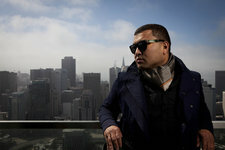 Lyrics Born has been one of the most licensed hip-hop artists in the world, with placements on Diet Coke, Motorola, Nokia, and Vans commercials, TV shows such as "Entourage", "Six Feet Under", "What About Brian", "Gossip Girl", and "Gilmore Girls", films like Michael Mann's "Collateral" and Justin Lin's "Fast And The Furious: Tokyo Drift", and videogames by EA Sports, 2K Sports and Atari. He has had sponsorships with Puma, Adidas, Diesel, and Evisu. "I came up in a tradition where you made records, then you toured," he says. "I like seeing people having a good time. That's how I feel like I'm moving forward, that things are in motion. I'm a performer—it's part of who I am."